When we think of an ideal treehouse view, it’s hard to beat mountains—especially if those mountains include the marvelous Mt. Hood. 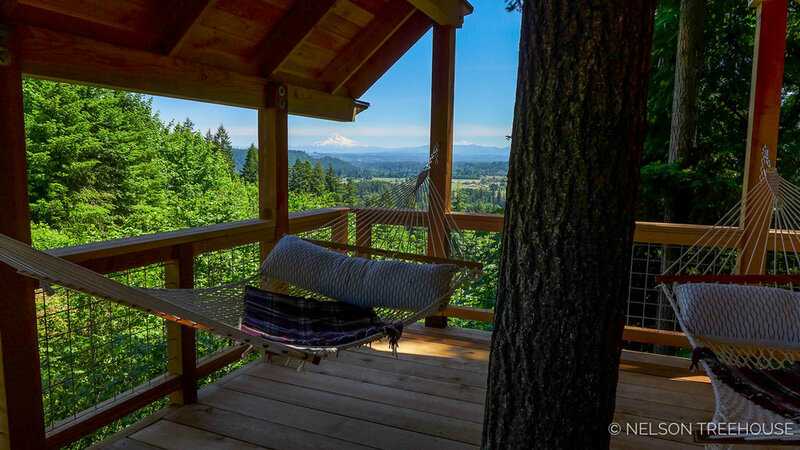 It was a delight to build this multi-pod treehouse with unobstructed views of the iconic Oregonian peak. A 50-foot cable bridge leads to the entry platform, which connects to the main pod via a short solid bridge. The treehouse resides on a precipitous slope. 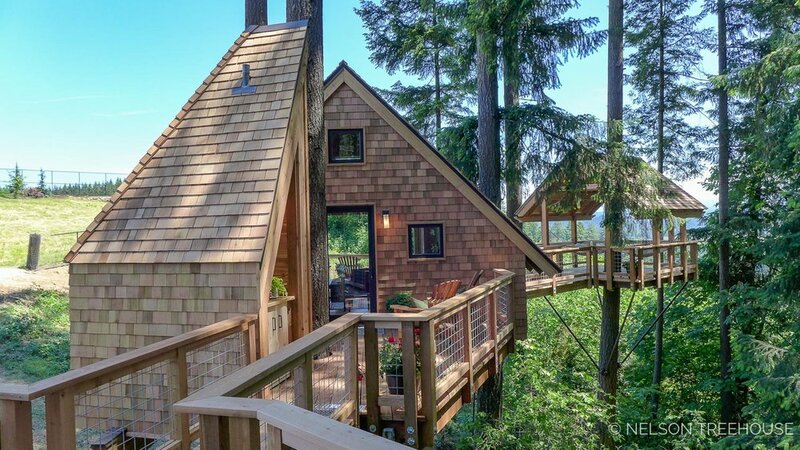 Slopes can be a treehouse-builder’s best friend. For one, they allow builders to minimize length of the access method (like this suspension bridge) by running it from the top of the slope to the treehouse. 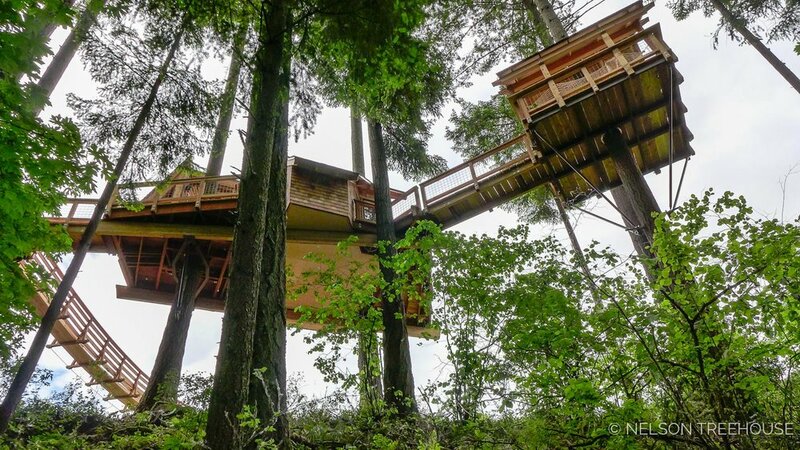 Plus, treehouses on slopes feel really high up, as the ground drops away beneath them! 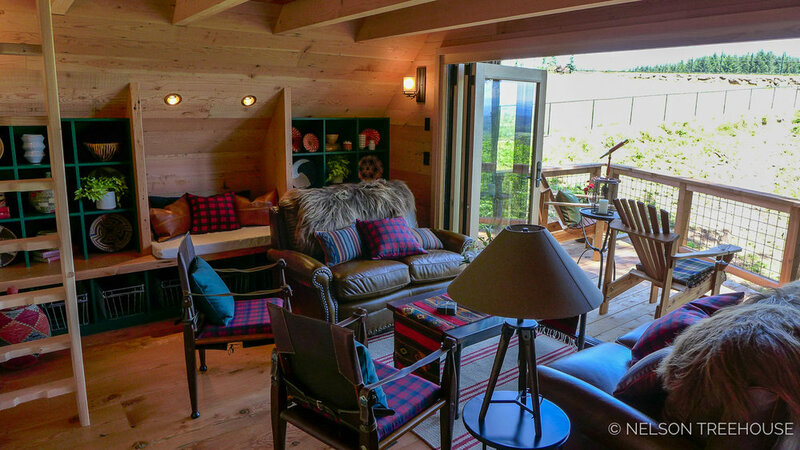 The treehouse also has an open-air platform: it’s the perfect hammock haven. This pod roosts nearly 30 feet from the ground. In total, this treehouse has three platforms (the entry, main pod, and hammock deck) and three bridges (one cable and two solid). Cedar shingles cover the exterior. 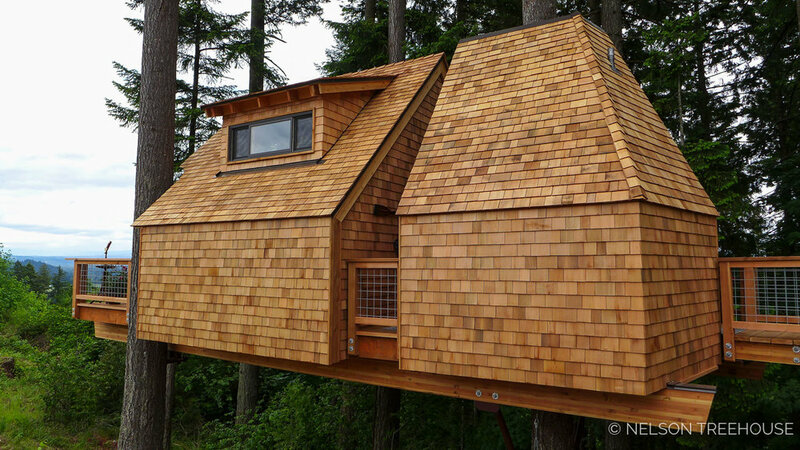 This fully tree-supported treehouse nests in prodigious Douglas fir trees. The main pod holds a cozy seating space. A wall of glass doors opens the interior up to the stunning surroundings. Built-in shelving, cabinets, and a bar top round out the space. A small room adjacent to the main pod holds a bathroom with a compostable toilet. The final bridge leads to the hammock deck. Can you spy Mt. Hood? No better place to soak in the views than from a hammock! We hope you’ve enjoyed touring this hammock haven! 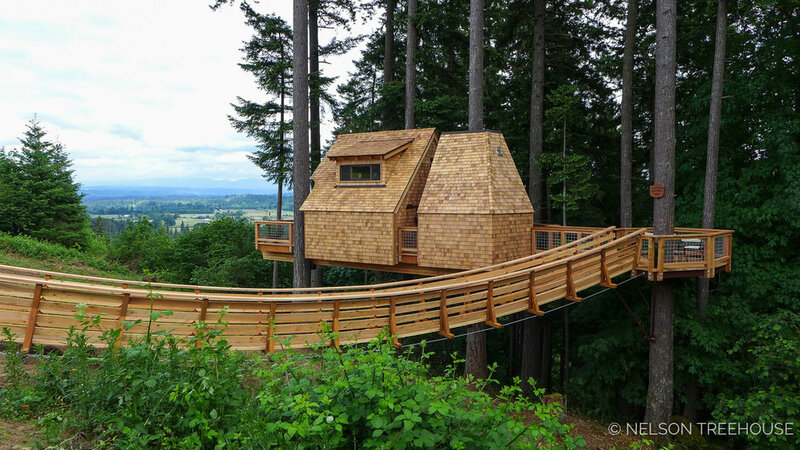 Let us know in the comments below what your dream treehouse view would be. 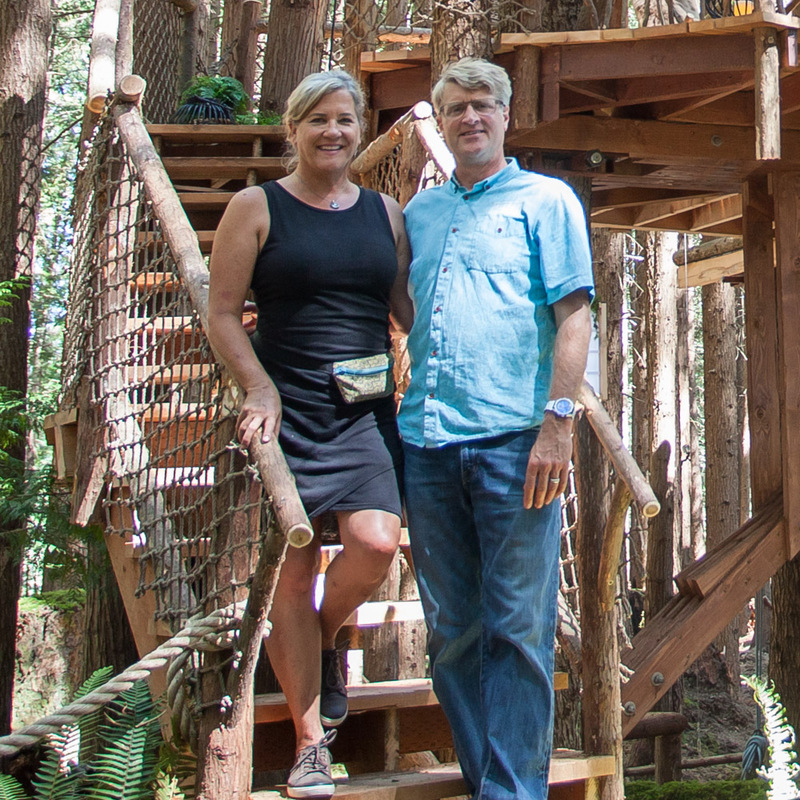 Check out all our photo tours from Season 11 of Treehouse Masters.